SEARCHING FOR CONTENTMENT ON MY WAY TO…SOMEWHERE. 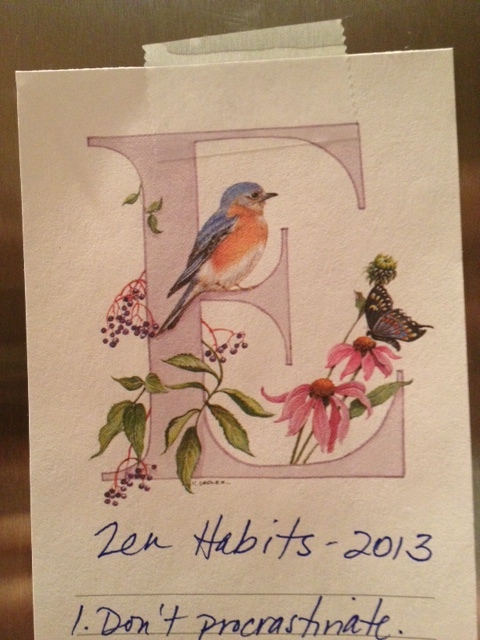 My Zen Habits list that’s taped to my fridge. So far…so good. cabinets open when I’m cooking (it makes grabbing something much faster!) I struggle to make my bed every day. I know that I’m messy, and I have been since I was a kid. And when I clean my house, which I love to do, the messiness irritates me. It takes me SO LONG to put things away! Or I wake up in the morning to dirty dishes because I was too lazy to clean them the night before. So when I was contemplating my first habit that I wanted to start/stop, this one shot to the top of the list. Updated to add: This is when I know the universe is talking to me. I just got this Nerd Fitness (if you don’t know Nerd Fitness…go read it. Do it now!) post in my email, which linked to yet another Leo Babauta blog post. Why do I bother wasting more time than I need to because I’m a lazy bum? Madness! Erin and Nate are getting married!